From home offices to commercial spaces, we offer solutions and design expertise to help you create a space that inspires you and your best ideas. Here are our top six Cantoni-designed workspaces that are as serious about productivity as they are about style. And be sure to click on the images to take the full tour. 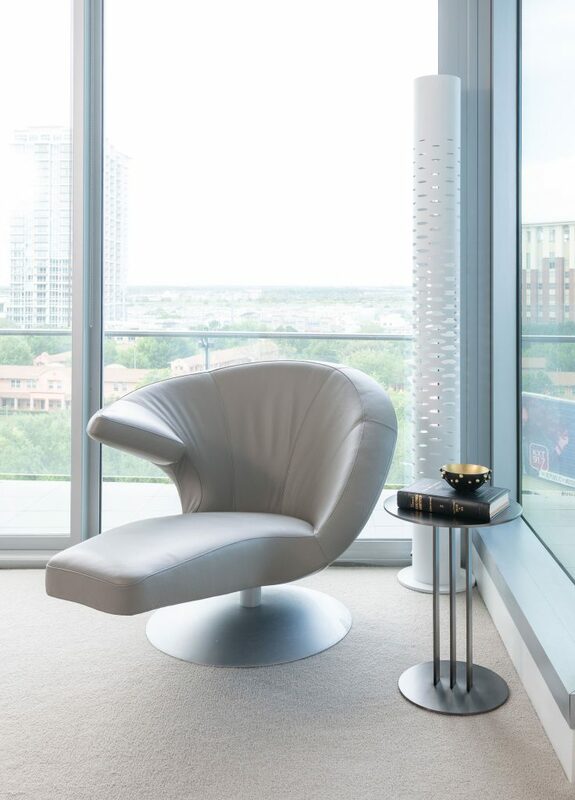 For this modern home office located at the top of Dallas’ buzzed-about residential tower Bleu Ciel, Cantoni designer Benji Rodriguez wanted to create a look reflective of the building’s style. 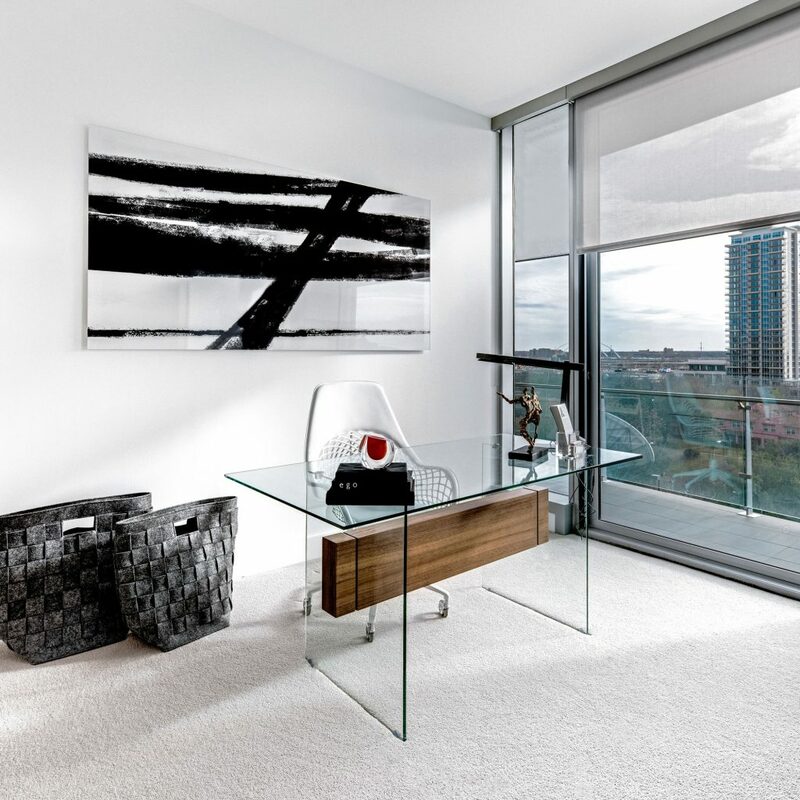 Using the unit’s abundance of natural light, materials and architectural details as a source for inspiration, Benji combined unique furnishings in varying materials with bold artwork for a modern and edgy look. 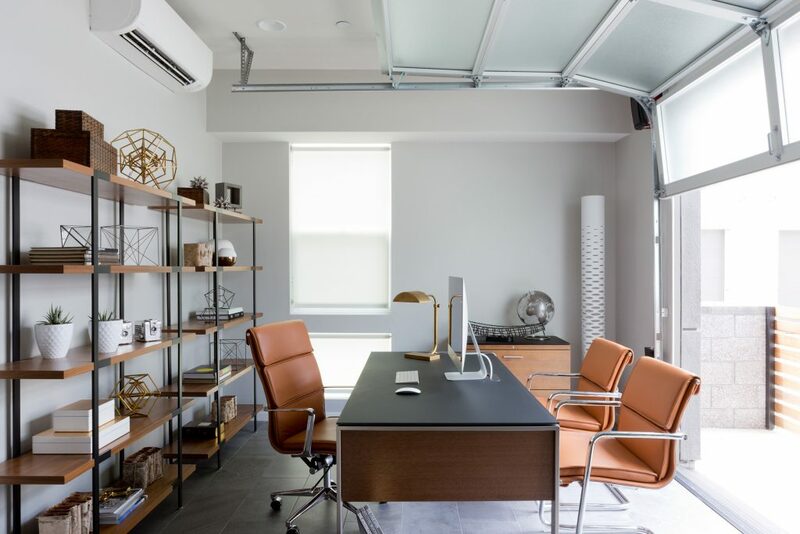 Everything about this power home office commands attention from the colorful and expressive photos on plexiglass to the eye-catching angles on our Nasdaq desk. But don’t be fooled by Nasdaq’s striking looks. Her ample surface area and floating storage drawer are key to maintaining an organized and productive office. For an extra punch of color, Cantoni designer Kohl Sudnikovich selected our Vistoso executive chair and swivel chair in bright and bold red. 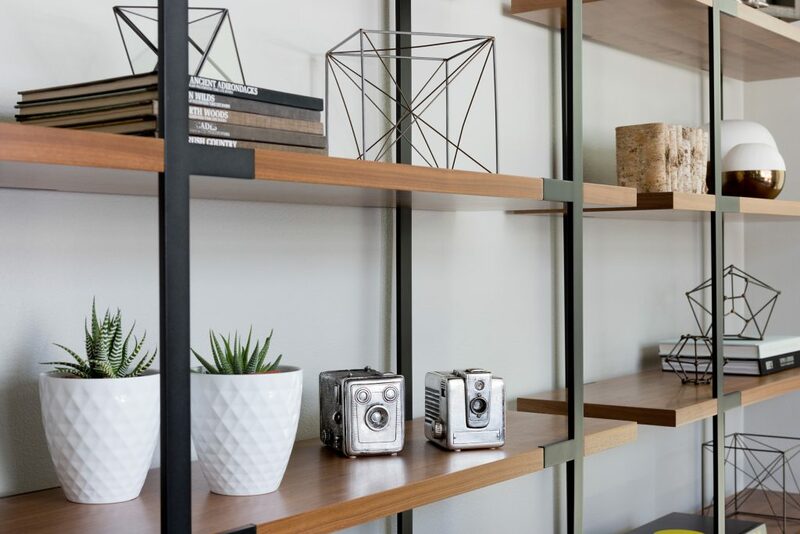 When a young, successful bachelor purchased his first industrial four-story townhome in an eclectic and fun community, in Costa Mesa, he turned to Cantoni designer Bonnie Sly to help him cultivate a smart, minimalistic mix reflective of his work-hard, play-hard mentality. In this garage-converted home office haven, Bonnie answered her client’s need for form and function with clean-lined furnishings from our Sequel Office Collection. 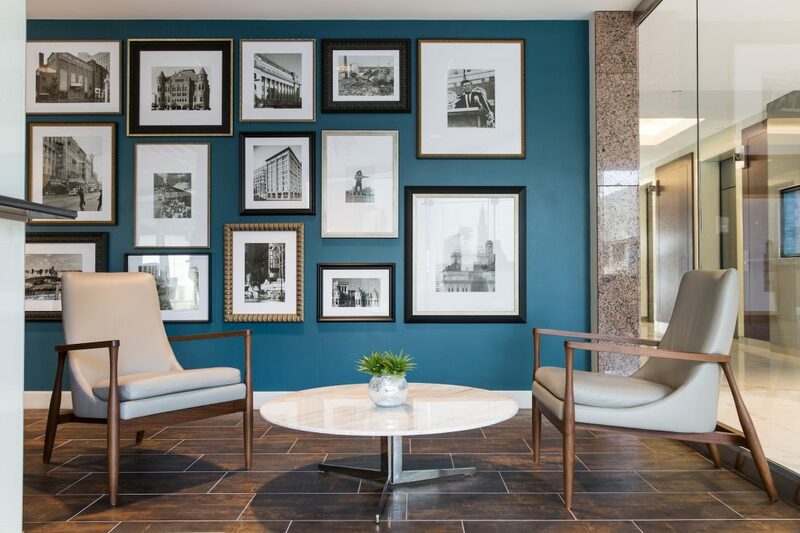 When Dallas-based mega real estate company Transwestern set out to renovate a 300,000-square-foot, 21-story commercial building overlooking three of the city’s prominent neighborhoods, they turned to Cantoni designer Josh Delafuente to create fun and sophisticated spaces for work and play. 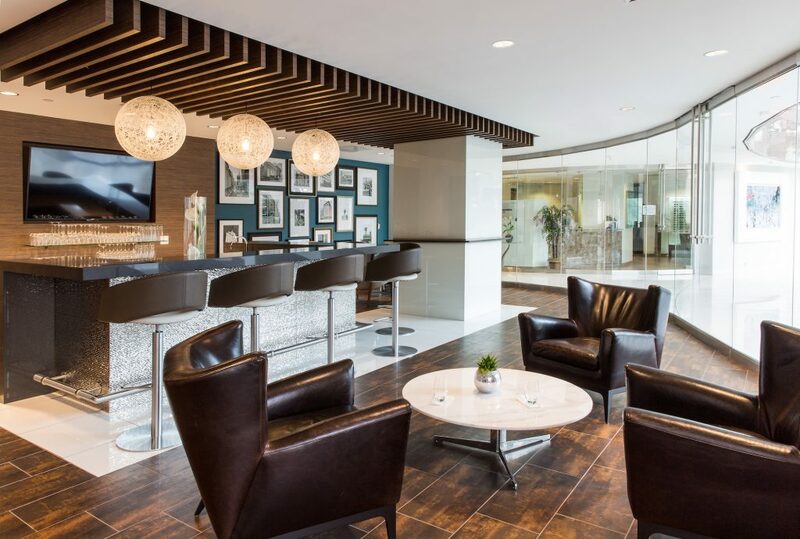 For the tenant lounge, which is complete with a griddled wood ceiling and silver-tile mosaic bar, Josh created two comfortable and inviting seating areas for the people who work in the building to escape their desks and relax. When it comes to designing shared workstations, it’s important to create a layout that offers each person his and her own personal space. To create an equally functional and stylish office for two, Cantoni designer George Saba customized our X19 desks, which are complete with wire management and a sleek modesty panel. The matching X19 return serves as a buffer as well as stylish storage. In each of the luxury units at Moda Decatur, a contemporary collection of 33 well-appointed townhomes is an underground flex room. 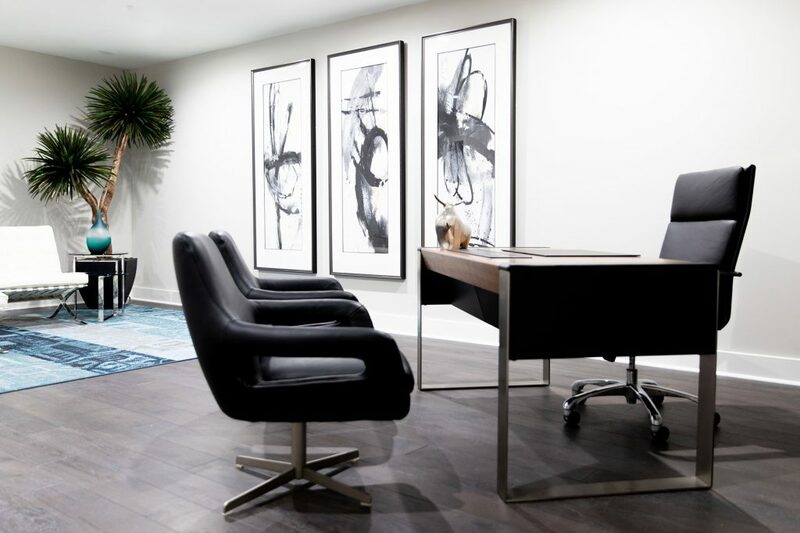 To give prospective residents a sense for how they could utilize the flexible, extra space, Cantoni designer Pam Satterly created a modern and professional home office. 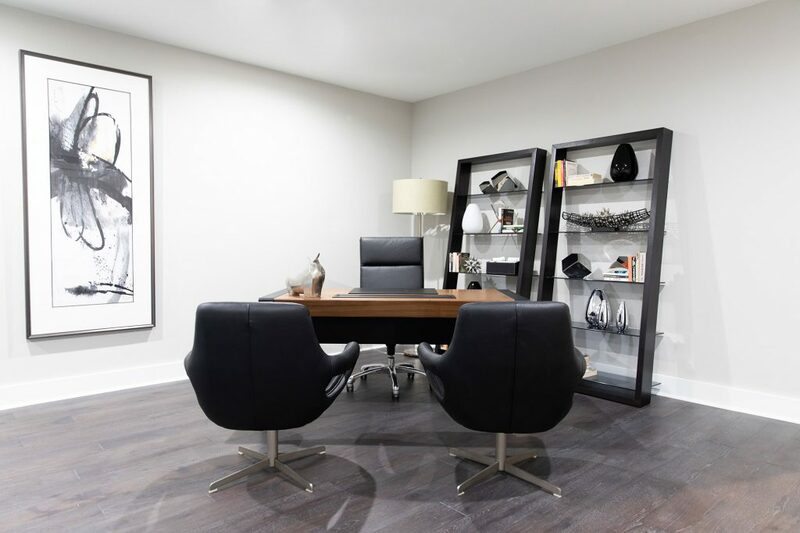 To create a comfortable yet functional layout, Pam added a pair of soft leather swivel chairs across from our Savana desk along with two chic white leather chaises nearby to serve as an inviting place for clients or friends to sit. Whether you’re in need of a major office makeover or simply looking for a few pieces to update your workspace, we have a wide selection of furnishings and accessories to fit many styles along with a talented team of designers available to help you put it all together! Shop our modern office furniture now and enjoy special savings plus free standard shipping on select items during The Home Office Event! If you’d like to connect with one of our designers for further assistance, click here to set up a free one-on-one consultation.